Dark matter is something that an astronomer or scientist cannot observe through ordinary telescopes. It does not emit or absorb light, and is considered responsible for holding all the normal matter in the universe together. Normal matter is something which can be observed and recorded through available means of technology. 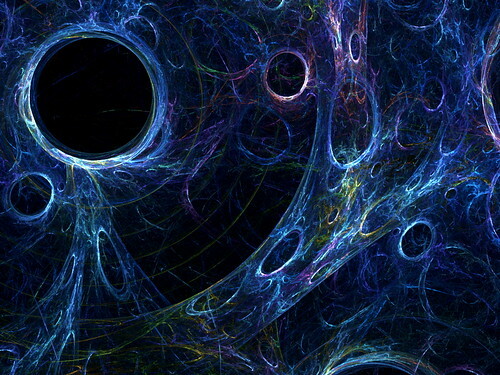 This article lists some very interesting facts about dark matter. Any and every fact about the universe originates from the famous Big Bang theory. This theory is based upon the idea that the universe, from the time of its conception, is expanding rapidly. The universe was formed around 13.8 billion years ago after a violent explosion, which gives the theory its name. As the universe gradually cooled down, the billions of protons, neutrons, photons, and electrons, which were formed as a result of the big bang, combined to form hydrogen and helium. Further, hydrogen and helium combined to form giant clouds, that would form galaxies. During this period, some of the first stars were formed. As the universe grew older, planets and galaxies were formed, making the universe the way we see it today. Have you ever wondered why the Earth doesn’t just fly out of its orbit and wander around in the universe? Or, why don’t galaxies split apart? The universe has its own provision to prevent collisions and disasters. It is true that the universe is expanding, but it is held together from the inside by invisible dark matter. Think about a Ferris wheel, the carriages are galaxy clusters, and the levers holding them is dark matter. Dark matter doesn’t interact with electromagnetic forces, and is completely different from the normal visible matter. There are still many mysteries about dark matter that need to be unfolded, but astronomers and physicists have gathered evidence about its presence. Recently, NASA’s Hubble Space Telescope sighted more than a million globular clusters of stars moving together in the center of a giant group of galaxies, called the Abell 1689, providing clues for the existence of dark matter. There is evidence of dark matter every time a double slit experiment is performed; it’s what waves. occupies three dimensional space. Dark matter is physically displaced by the particles of matter which exist in it and move through it.